The Battle of Rafa, fought on 9 January 1917, marked the end of the British campaign in the Sinai Peninsula during the First World War. Corporal Joseph Egerton’s personal photographs show how the British Army fought the war in Sinai and the logistical problems they faced fighting in the desert. The war in Sinai had begun in January 1915, when an Ottoman force attempted to raid the British-controlled Suez Canal. This was an important asset allowing access to Alexandria and Port Said. Seizing it would cut the British communications with East Africa, India and Asia and prevent Australian and New Zealand troops making their way to the Mediterranean and Europe. The Turkish attack failed and the British fortified the length of the Suez Canal. Failure at Gallipoli in 1915 dashed British hopes of a quick victory over the Ottoman Empire. Defending the canal for an extended period demanded manpower the Army could not sustain, especially with increasing demands for fresh troops on the Western Front. What’s more, the mere threat of a Turkish raid was enough to keep troops tied down in Egypt. While the British were easily capable of defeating a Turkish attack, this would not necessarily deter the enemy from attempting one. Lieutenant General Archibald Murray, appointed as British commander in Egypt in 1916, decided to go on the offensive to push the Ottomans out of Sinai. He thought that in driving them out of the peninsula, the British could reduce the enemy threat on the Suez Canal and force the Ottoman Army to defend their imperial territory in southern Palestine. Murray formed the Egyptian Expeditionary Force (EEF) on 10 March 1916. He reorganised and expanded the Army in Egypt, incorporating men left over from the Gallipoli campaign. The first action of the EEF was to cut Ottoman routes to the Suez Canal over the spring of 1916. By destroying wells and waterholes, they could stop the enemy from advancing across the desert. The EEF then occupied the town of Romani in May 1916, so it could not be used as an Ottoman base for raids on the canal. The Ottoman Army attempted to seize Romani with a counter-attack in August 1916 but was repulsed by the defending British. The resulting Battle of Romani marked the end of the enemy campaign against the Suez Canal, but its defence still remained a high priority for the EEF over the following years. Joseph Egerton, for instance, was defending the Suez Canal with the Shropshire Yeomanry while the Battle of Rafa raged on the other side of the Sinai Peninsula in January 1917. After defeat at Romani, the Ottomans retreated to Bir-El-Abid, where their proximity to the Ottoman border meant they could keep their bases stocked and supplied without difficulty. But if the British were to push them all the way back to Palestine, the EEF would need to cross hundreds of miles of desert. This was no easy feat; water, ammunition and supplies were essential for any man and horse traversing the unforgiving environment. But providing these for the numbers needed to make a successful attack was an immense logistical problem. Success in Sinai would depend on how well the British Army could supply its troops. In February 1916 construction began on a railway line which would eventually stretch hundreds of miles to the Palestine border. Joseph Egerton, as a railway clerk in civilian life, took a particular interest in the progress of the desert railway. Many of his photographs show tracks, carriages and rolling stock, and demonstrate how the railroad helped to move the Army across the Sinai Peninsula. Water provision was another problem to be tackled. 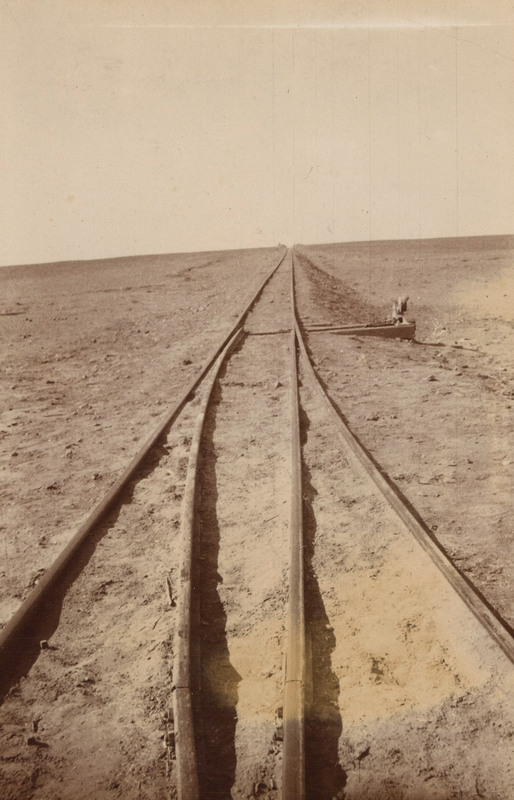 At the same time construction began on the desert railway, the British Army were also working on a water pipeline to span the Sinai Peninsula. But this did not immediately solve the problem. Even while under construction the railway could still carry men and supplies forward, but the waterline could not do this. The men working on it, and indeed the mounted infantry providing protection and diversion from Ottoman raids during construction, still needed water. As Joseph’s photographs show, support came from the Egyptian Camel Transport Corps. Between 1916 and the end of the Sinai and Palestine campaign in 1918, 170,000 Egyptian volunteers with their 72,500 camels transported water to and from the British front. Despite extreme weather conditions and hostile terrain, they were able to provide a vital service. Each camel could carry between 50 and 70 litres of water, and though they were slow, they usually arrived on time. 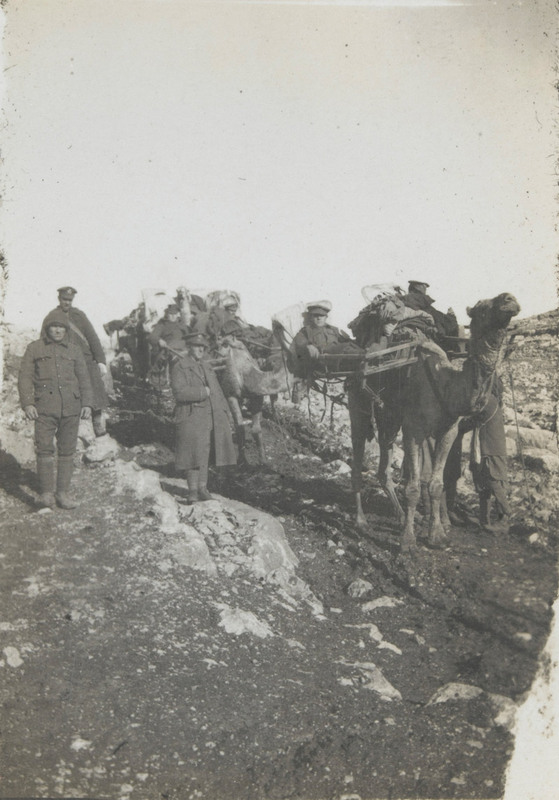 Over the course of the campaign camels were also used for transporting medical supplies, food and shelter; they could even serve as ambulances, carrying two wounded men at a time. The railway was also used for transporting water. But providing for the troops in the desert ultimately held up the Army’s progress over the Autumn of 1916. 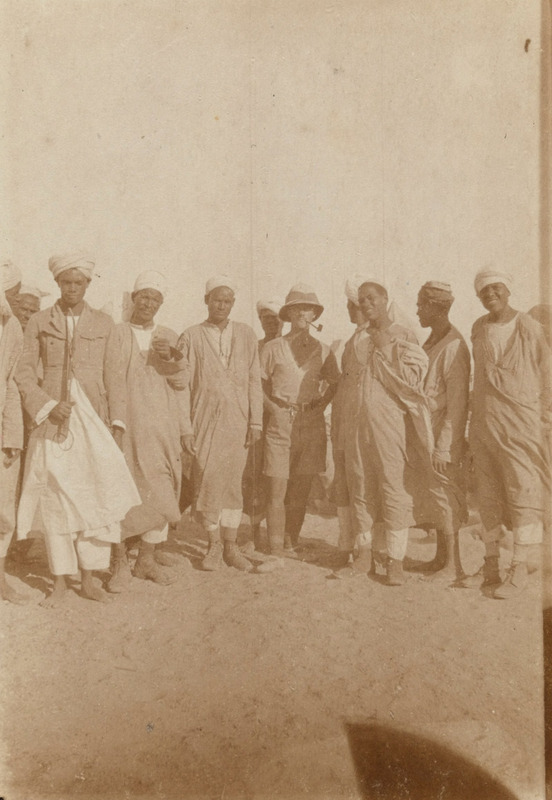 The EEF arrived at the Ottoman forward base of El Arish in eastern Sinai on 20 December 1916, their progress having been delayed by the construction of the railway and the water pipeline. Nevertheless, three days later the EEF defeated the Ottomans in El Arish at the Battle of Magdhaba, forcing them back once again. In the following days, reconnaissance reported that a large enemy garrison had amassed at Rafa, a border town between Sinai and Palestine. In order for the EEF to succeed in removing the Ottomans from Sinai, they would need to be defeated. In December 1916 Lieutenant General Philip Chetwode assumed command of the EEF troops at El Arish. They were known as the Desert Column, made up of the Anzac Mounted Division (British, Australian and New Zealand mounted infantry), three battalions of the Imperial Camel Corps, horse artillery and six light armoured cars. On 8 January Chetwode and the Desert Column departed El Arish for Rafa. They made a difficult 30-mile journey across sand dunes and desert before camping near Rafa during the night. They prepared the attack for the next morning, planning to first surround the Ottoman positions, before a mounted advance on the enemy defences. At a short distance from the Turkish trenches the troops would then dismount to attack on foot. The battle began at 8.30am on 9 January. The artillery opened fire on the Ottoman position, but the ground advances got held up by the enemy fortifications. On dismounting, the British were forced to crawl towards the Ottoman position because counter-fire was heavier than expected. The Turkish had a handful of German machine gunners providing covering fire and support from German aircraft. On the British side, the vehicles holding ammunition had been left behind at the overnight camp, so in the early afternoon British fire began to slacken. Worse still, they began to receive word that an Ottoman relief force was making its way to Rafa, suggesting the attacking troops might soon be outnumbered. By the afternoon, the British had made limited gains. Fearing the battle would be a failure, Chetwode made plans to withdraw. But before Chetwode’s order could be issued, the British were attempting another assault. Their heavy guns had moved up to a better position, which provided cover for the troops, and created a smoke screen. The men were able to get much closer to the enemy lines than they had in the morning. In a final push, the New Zealand Mounted Rifle Brigade captured one of the Ottomans’ dominant redoubts after a bayonet charge. Enemy fortifications were positioned in a circular pattern, so once one had been seized by the Desert Column, the others soon began to fall. Australian aircraft, recently fitted with wireless communication, had tracked the progress of the battle and provided support by bombing enemy positions. At the end of the day, the cameliers of the Imperial Camel Corps charged the opposition and were met with a white flag of surrender. Around 1,500 Ottomans were taken prisoner. While the battle itself was short and bitter, it finally expelled the Ottomans from the Sinai Peninsula and marked a new phase of the war in the desert. The Palestine campaign could now begin, with an advance towards Gaza to attack the Ottoman Empire directly. Joseph Egerton (1884-1952) was born in Blaenau Ffestiniog, Merionethshire, Wales on 17 December 1884. Following the death of his father, also Joseph Egerton, he was sent to live with his grandmother, Anne Hewitt, and her second husband, Samuel Davis, in Corwen. During Joseph’s childhood his widowed mother, Mary Acton Stanworth, worked in a registry office for servants in Chester. But she returned to Wales sometime during the 1890s to live with her child. Joseph’s father had been a railway clerk, and his step-grandfather, Samuel, a railway engine driver, so naturally the 15-year-old Joseph also joined the family profession as a ‘passenger’ (member of engineering staff) in December 1899. Following the death of Joseph’s grandmother, Anne, his mother married her father-in-law, Samuel, in 1902. After Samuel’s death, she moved to Wellington in Shropshire with Joseph, who was now working as a railway clerk. Joseph joined the Territorial Army in 1912. As a private in the Denbighshire Hussars Yeomanry, he undertook training at their camp in Rhyl. On 25 August 1914, Joseph signed up for service with the 1/1st Shropshire Yeomanry, part of the Welsh Mounted Division. After a year spent on home defence duties in East Anglia during 1915, the unit was dismounted, absorbed into the 4th Dismounted Brigade and sent to the Middle East. Now promoted to corporal, Joseph arrived in Alexandria on 15 May 1916, where he was sent to Minia in Egypt, as a vice-cook to the Camel Corps. His unit fought against the Senussi in Libya and later against the Turkish in Palestine. Joseph spent much of his time in Sinai and Palestine suffering from ailments and diseases brought on by the desert conditions. He was admitted to hospital four times in his first year in Egypt. 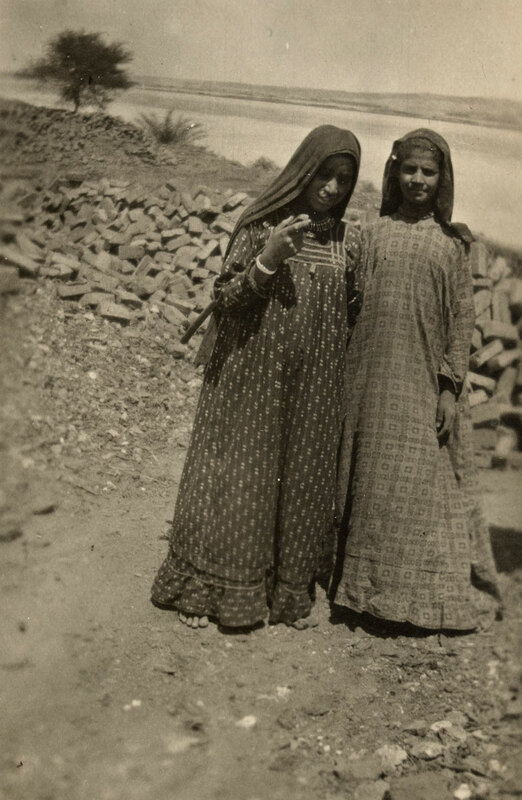 Armed with his camera, he took numerous photographs of Egyptian street scenes and people, and captured the bleak desert conditions faced by the British Army working in the area. For the campaign in Palestine the unit was merged with the 1/1st Chester Yeomanry and became the 10th (Shropshire and Cheshire Yeomanry) Battalion of the King’s Shropshire Light Infantry in the spring of 1917. Joseph went on leave after taking part in the Second Battle of Gaza in April 1917, returning to Palestine in August after the death of his mother. The battalion took part in the capture of Beersheba on 31 October and the Third Battle of Gaza in October and November. At the end of the year they supported the capture and defence of Jerusalem. 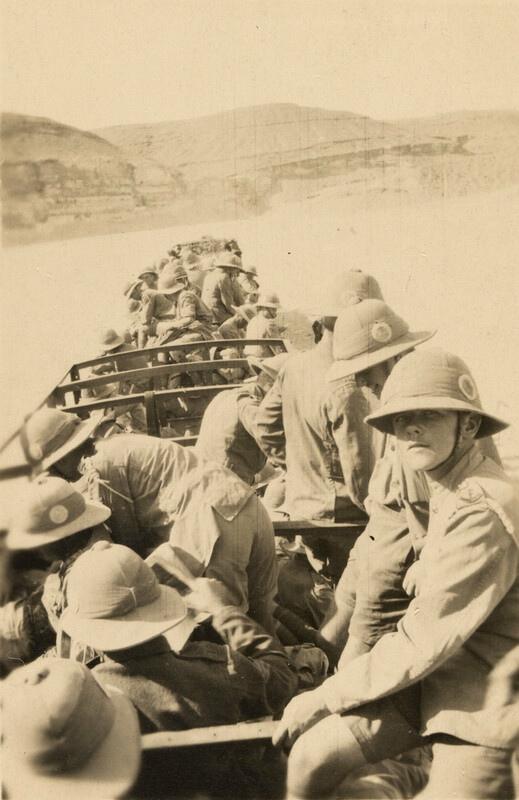 Following heavy losses caused by the German Spring Offensive in March 1918 the British Army was forced to use men of the Egyptian Expeditionary Force as reinforcements for the armies on the Western Front. Egerton’s regiment arrived in France in May 1918 and took part in the Second Battle of the Somme in August and September. Shortly after on 6 September 1918, Joseph was wounded in a gas attack and spent three days receiving treatment at the American hospital in Rouen. He was later moved back to England, to Gloucester Voluntary Aid Detachment Hospital, and witnessed the end of the war recovering at the Command Depot at Heaton Park, Manchester. Joseph was discharged from the Army on 10 March 1919. Later that year he married Hetty Barclay Taylor on 8 December in Stockport, Cheshire. The couple had a son, John, who was born on 13 January 1924. Joseph resumed his career as a railway clerk, working with Great Western Railway in Manchester and later Birmingham into the 1930s. He retired during the Second World War and lived in Scarborough, Yorkshire in later life. Joseph died there aged 68 on 26 December 1952.